Elvis Presley had completed his movie, Kid Galahad it is one of his finest roles to date, but it was a surprise how the film was ever completed his troubled co-star Gig Young Gig Young stars alongside Elvis in this cool flick and a must see for everyone, but behind the set there was tension and fights all caused by Gig and a certain beautiful actress Elizabeth Montgomery. Gig is married to the daughter of actor Robert Montgomery, the young and beautiful actress Elizabeth Montgomery. 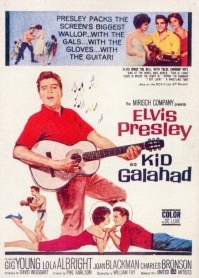 After Kid Galahad was completed, Gig carried on the argument about Elvis. Liz was so fed up of hearing it. After three weeks of arguing the fighting got so intense with Gig convinced that his wife had an affair with Elvis, Gig packed his bags and left the house. It seems that Gig Young’s private life did not improve and he became unhinged. He was an alcoholic who had a succession of failed marriages (second wife, Sophia Rosenstein died after two years of marriage). His third spouse was “Bewitched” star, Elizabeth Montgomery, to whom he was wed for the seven years preceding her famed television role. In September of 1978, Young married his fifth wife, Kim Schmidt (thirty-three years his junior) whom he had met while filming The Game of Love in Hong Kong. Three weeks into the marriage, Gig Young shot his wife – and then himself – in the head with a .38 revolver to fulfill an apparent death pact. Investigators are still not clear on the tragic details, but were surprised to discover an additional three revolvers and 350 rounds of ammunition in the apartment. Young was not quite 65, his bride 31. During the filming of Kid Galahad in the winter of 1961, Elvis’s friends ordered a custom made directors chair as a prank gift. The chair had “MR. PRESLEY” stamped on the back of it; they presented it to the star on the first day of filming. Elvis turned to the crew, the director, and the producer and asked, “Mr. Presley? Why so formal?” Director Phil Karlson said, “Only the best for our star!” Elvis hated the formality of it. He wanted to be treated like one of the boys, and the chair destroyed that illusion. The next day a new chair replaced the formal one. The bright red canvas sported bold print that read “JUST PLAIN OL’ ELVIS.” Elvis laughed out loud and plopped into the chair.